Stay warm this winter with a chunky knit cable hat in a delicious cream yarn. 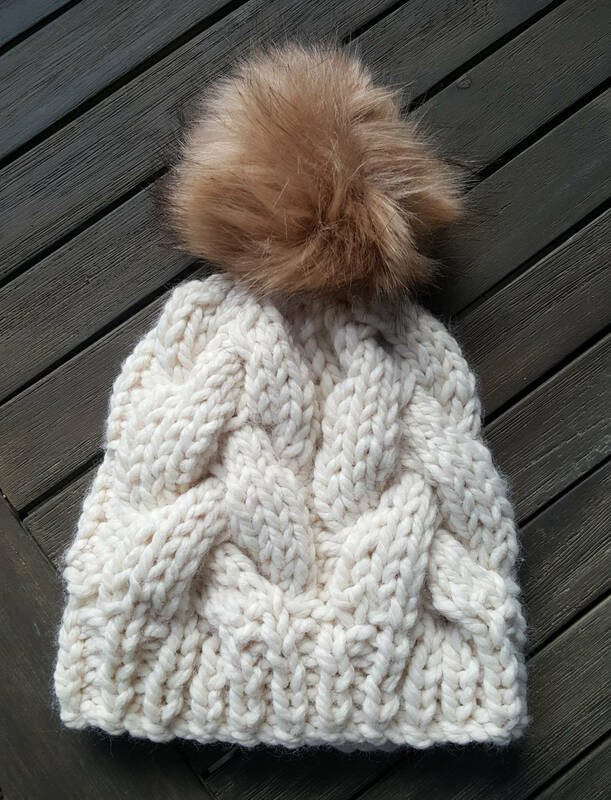 Hat is topped with a furry, fuzzy tan pom-pom. Hat will fit a women's head. 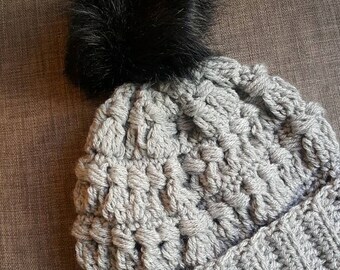 Crochet Gray Hat with Pom-Pom. 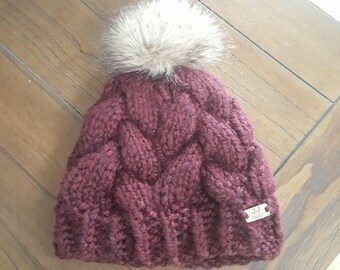 Women's Crochet Hat for Winter. Hats were perfect Christmas gifts! Loooove love love my hats! I got one for my favorite toddler and one for me and they're perfect. Comfortable, warm and stylish. Jayna was super helpful, quick to prepare the hats and quick to deliver. Please make payment 72 hours after purchase, unless mailing a check or money order. If, when you receive your JJCrochet item, you are not satisfied with it, you may return the unworn item within the first 30 days and receive a refund. No exchange or refund on patterns. If you would like a tracking number or insurance confirmation, please let me know and I'll add it to your package. JJCrochet products are shipped via First Class Priority Mail or FedEx ground. When you buy any items, you can also purchase shipping insurance for an additional $2.00. To purchase insurance for your package, place "Shippping Insurance" in your 'message to buyer' and I'll send you an updated invoice. All items will be mailed to the address associated with the paying Paypal account unless otherwise specified by the buyer. Patterns are available for instant download and never expire. For all other JJCrochet items, please allow up to two weeks delivery time, though most will ship sooner. If you don't receive your pattern within 12 hours or your hand-made item in two weeks - please contact me! Please allow 2 to 3 weeks for delivery for hand-crocheted or hand-knit items. Most items in my shop are made-to-order and take time to create. If you are working on a tighter deadline and need your item sooner, please message me and I'll work with you to ensure your items gets where it needs to be. Thanks!